This page provides instructions on how to update the firmware for Personal Audio System SRS-X99 to version 1.60.2994. Modify the screen display of SongPal, when playing iPod on the USB-A mode. Modify the screen display of SongPal, when playing the AIFF contents on the USB-A mode. Improve stability of the performance when changing from the playback on the USB-A mode to casting at Google Cast app. Note: Connect the speaker to a PC directly with the LAN cable. Connect the AC power cord to the speaker. Press the button to turn the power on. Wait until the LINK indicator stops flashing and stays lit in orange. When unit starts the updating process, the update button will begin to flash 4 times, depending on the progress, number of flashing will be reduced gradually to one flash and unit will switch to standby mode. This indicates the unit has been updated successfully. If the flashing shows differently during the process, please refer to some of the flashing condition as stated above. Note: This is the dedicated update file for SRS-X99 only. You cannot use this file with other Personal Audio System. The SRSX99V1602994 folder is now open on your computer's desktop. 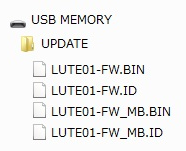 UPDATE files are 4 files of ”LUTE01-FW.BIN”、”LUTE01-FW.ID”、”LUTE01-FW_MB.BIN”、”LUTE01-FW_MB.ID”in extracted folder, “UPDATE”. The SRSX99V1602994 folder is created on your desktop. Connect the AC power cord (supplied) to the the speaker. While UPDATE button lights up, insert the USB flash drive to USB A slot on the speaker rear side. Insert USB flash drive (included update files) into USB-A port (terminal). The number of flashes of the UPDATE button will change according to the progress of updating. The UPDATE button flashes four times at first, and decreases by one flash, then turns off when updating is completed. Do not turn the speaker off during the update. Keep the speaker connected to the power supply and network while updating.